CARPE DIEM: Economist Paul McCracken, 1915-2012, R.I.P. Economist Paul McCracken, 1915-2012, R.I.P. 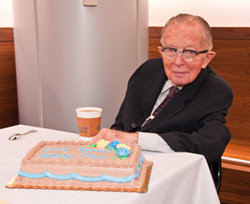 Economist Paul McCracken on his 95th birthday. Legendary economist Paul W. McCracken died last Friday in Ann Arbor, Michigan at the age of 96. In addition to being a professor of Business Administration, Economics, and Public Policy at the Ross School at The University of Michigan since 1948, Paul McCracken served as an economic adviser to Presidents Nixon (chair, Council of Economic Advisers), Eisenhower (member, Council of Economic Advisers), Kennedy (member, task force on the domestic economy) and Johnson (member, Commission on Budget Concepts) from the 1950s through the 1970s. McCracken was associated with The American Enterprise Institute in Washington, D.C. and chaired AEI's Council of Academic Advisers in the 1980s and also served as interim president of the institute in 1986. "I thought price controls were a bad idea for a very simple reason. You couldn't look back into history and point to a success story." That's some timeless economic logic from Professor McCracken that is still relevant today and should be more widely observed by politicians who advocate price controls like the minimum wage, ticket re-sales (Michigan politician wants to limit the markup on tickets sold on the secondary market t0 10% above face value), and rent control. 2. Paul McCracken's New York Times obituary. 3. Washington Post article on Paul McCracken. 4. Notice from the Ross School of Business. 5. Article in the Michigan Daily (student newspaper in Ann Arbor). Note: Paul and I served together on the Mackinac Center for Public Policy's Board of Scholars for the last 15 years, and I was privileged to have met him several times and will fondly remember those encounters. For a scholar of such impressive accomplishments, he was one of the most friendly, gracious and approachable people I have ever met. I must admit I have not heard of Paul McCracken until this morning. I must find out more about him.